After the huge success of last year, Comedy Central's Friends Fest has arrived back in Newcastle this week and I'm so excited to be sharing our experience with you! I have very fond memories of watching Friends on TV when I was growing up. The sitcom first aired in 1994 and I remember me and my friends being completely obsessed with Ross and Rachel's "will they won't they" relationship and spending entire science lessons discussing it! I grew up with the show and to this day I still quote from it daily - I have started so many conversations with "it's like that scene in Friends" that I have honestly lost count. Ask me to name my favourite moments and I would happily sit here for hours listing them - the one where Joey goes on a Game Show ("paper, snow, a ghost! "), the one where Ross and Monica perform their ridiculous New Years dance and of course, the one where Ross attempts to get a tan. In fact, just writing up this blog post saw me disappearing into an hour long YouTube hole watching my favourite moments. 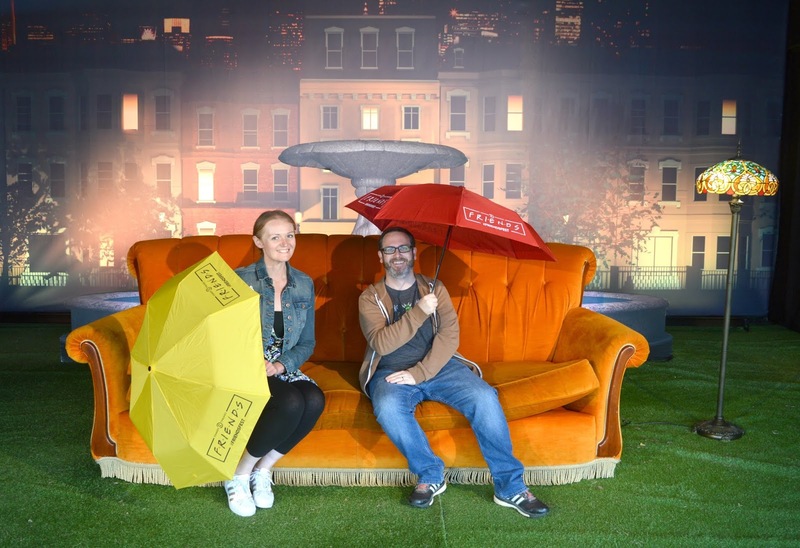 So I was beyond excited to spend the evening indulging in my Friends obsession with a trip to Comedy Central's Friends Fest which is being held at Castle Farm Fields in Newcastle this week. Promising an evening of iconic moments, unique opportunities and the real highlight, a special set tour I couldn't wait to get started! We were very lucky to be invited to a VIP night at Friends Fest which meant a slightly less crowded experience for us so please bear that in mind when reading this review. 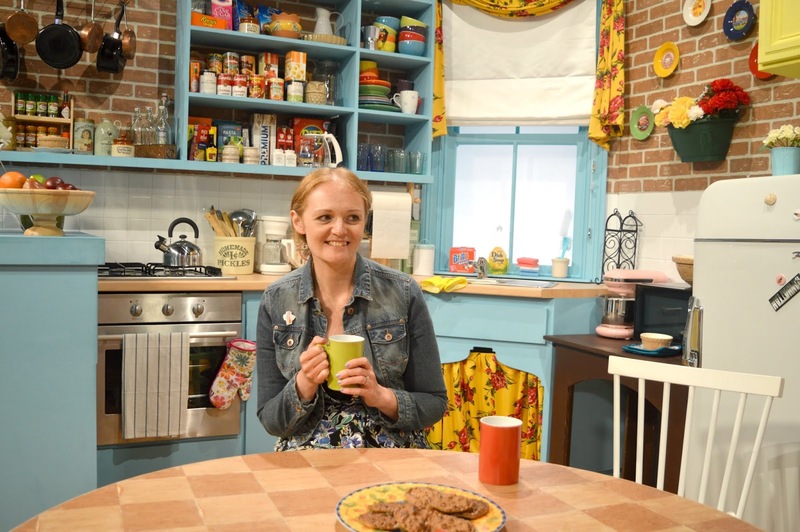 I have heard a few stories from others that the set tour in particular gets a little hectic. Once you've handed in your ticket and gone through security you're free to roam Friends Fest for as long as you like. 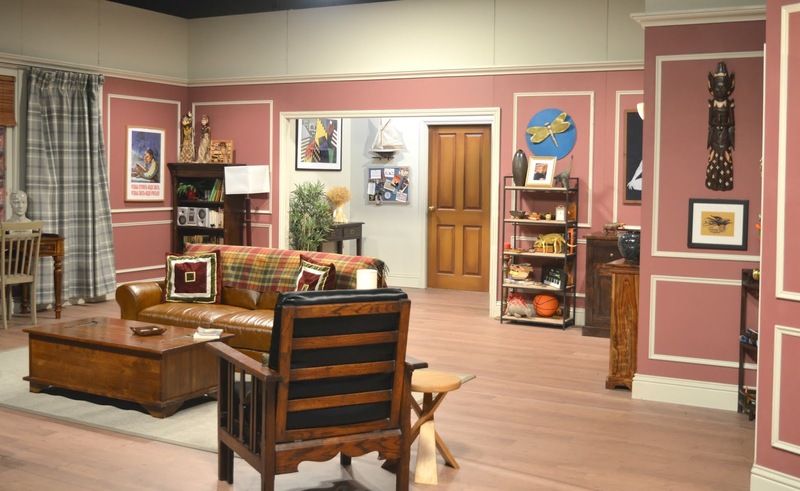 With the exception of your pre-booked studio tour you're able to spend as long as you like exploring and taking photos and there are several opportunities across the site to geek out at Friends memorabilia and set recreations. Make sure you keep your eyes open because there are photo opps around every corner. 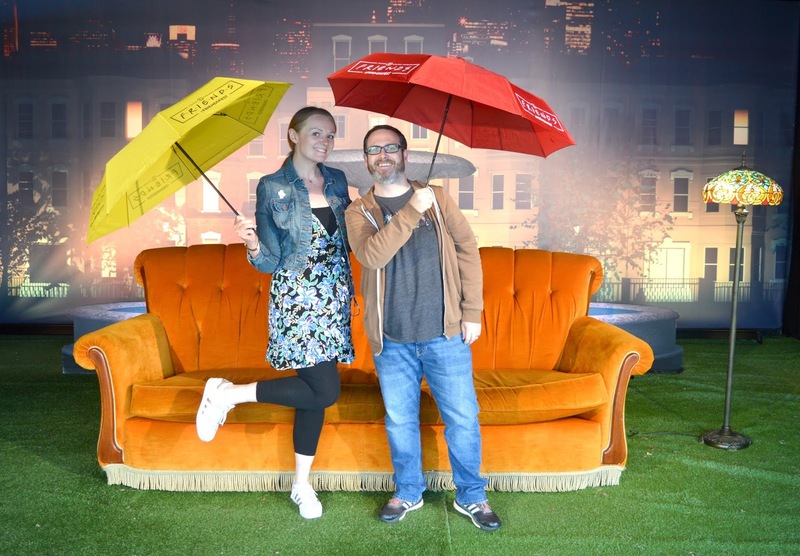 We started our visit by "Recreating the Titles" - the famous orange sofa sitting in front of a fantastic back drop and plenty of umbrella props we were let lose to recreate our favourite moments and take as many photos as we liked. The staff at Friends Fest happily take photographs for you which means you can include all of your family and friends in the photos and I'd definitely say when it comes to this iconic moment the more the merrier. 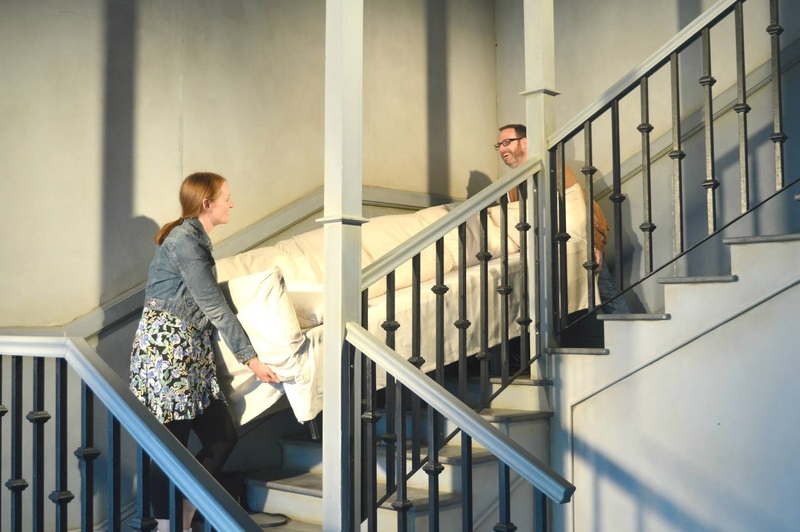 We followed this by a visit to the mini set next door where we got to recreate the famous PIVOT scene where Ross, Rachel and Chandler struggle to get a sofa up the stairs. I'm sure we're not the only people to shout PIVOT at each other every time we're struggling to carry something - it's certainly a moment that's stuck in my mind ever since first seeing that episode. It wasn't long before we'd started feeling a bit peckish so we decided to explore the food trucks on offer. 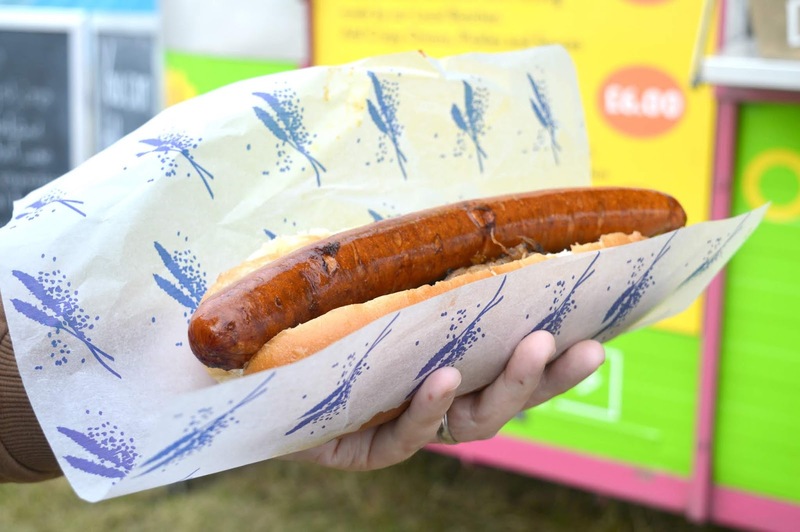 The food at Friends Fest is all themed around the show and if you're a fan of typical American food you won't be let down. 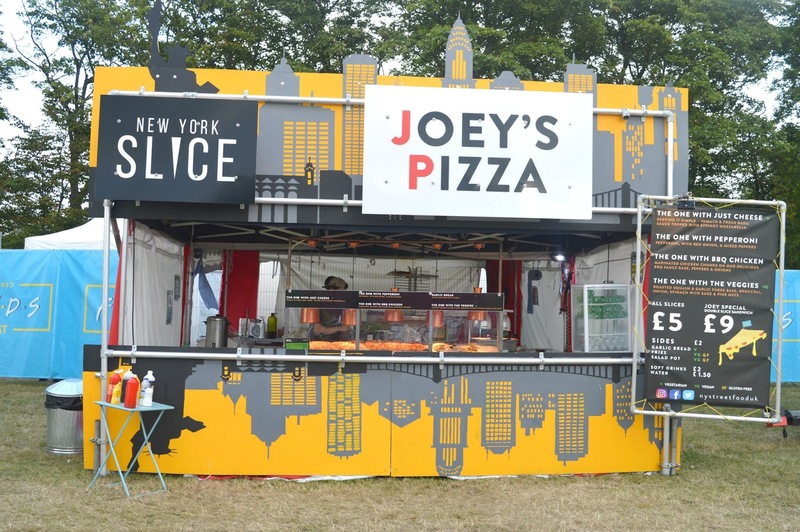 Joey's Pizza sells pizza by the New York slice for £5.00 each and, if you're feeling extra hungry, the "Joey Special" costs £9.00 for a double slice sandwich which sounds pretty damn good to me! Just remember to order enough because - Joey doesn't share food! The best way to enjoy your food is at one of the tables in front of the huge screen. Favourite moments from Friends are played during your visit with a few live quizzes thrown in. I'd always considered myself to know quite a bit about the show before I heard the questions at the quiz - it may be worth swatting up on your knowledge before you go. There are prizes to be won but if you fancy getting your hands on a mug, t-shirt or poster there's a sizeable gift shop on site where you can buy some memorabilia without having to embarrass yourself trying to answer questions! 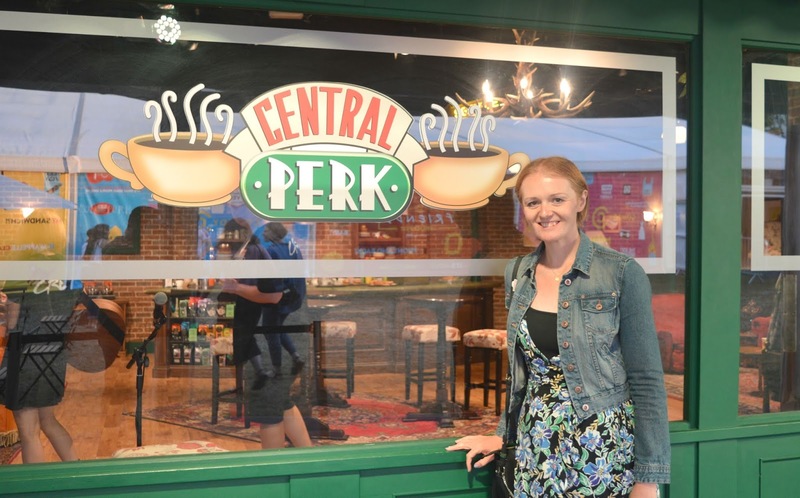 One of my favourite parts of our visit was popping into Central Perk for a Smelly Cat singalong. A Phoebe inspired busker took to the stage to sing some of the classic songs from the show and believe me you haven't lived until you've partaken in a massive singa-long to the most ridiculous songs you've ever heard. I'd completely forgotten how amazing Phoebe's Holiday Song is - "and please tell Joey that Christmas Will Be Snowy" - brilliant! 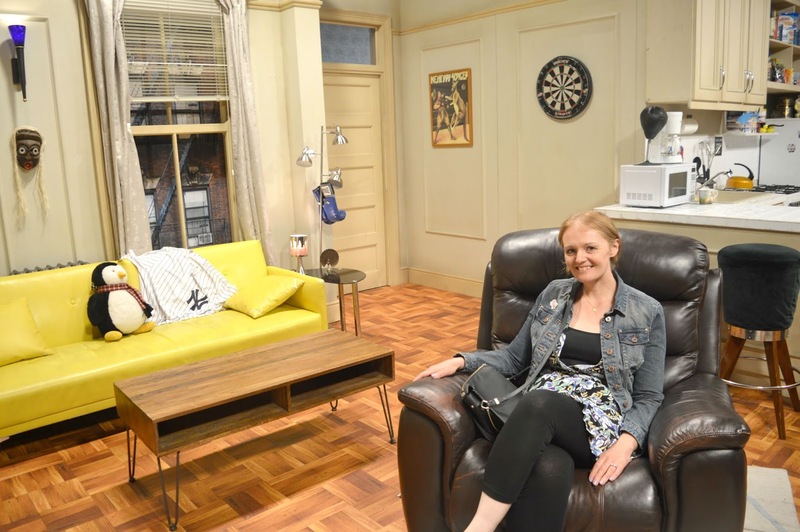 I loved having the opportunity to pop behind the counter, move over Gunther I'm coming for your job, and of course that giant orange sofa was there for everyone to sit on for photographs. 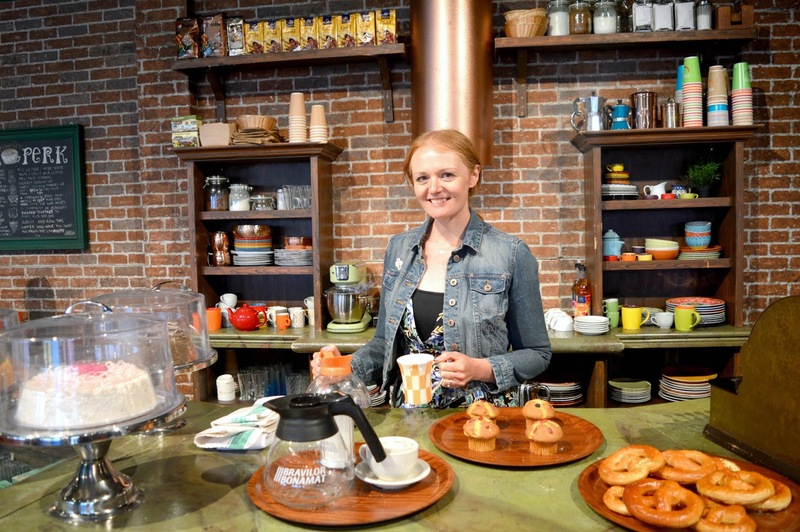 The best part, there was an actual counter in Central Perk where you could buy coffee meaning you could sit on set and enjoy a latte - bliss! Other things around the site included the chance to hop into Phoebe's famous yellow taxi and fancy dress stations including a photo opportunity to wear wedding dresses. Every photo opportunity is manned by the fantastic staff who are more than happy to help out with your photographs. 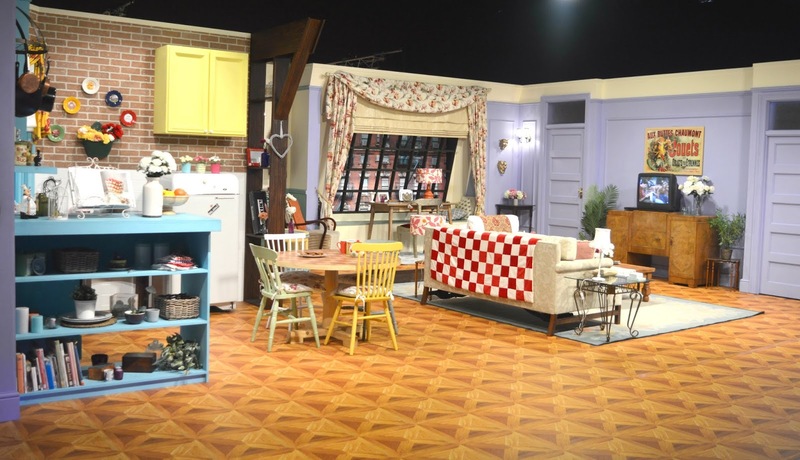 The main reason most people go to Friends Fest is, of course, the set tour. When you book tickets you select an alloted time so go into the studio as part of a group tour. There are three apartments to explore - Joey and Chandelers Bachelor Pad, Monica's Apartment and Ross' apartment. You are let into each one separately and given 10 minutes in each. It is a little crazy trying to get photographs, with everyone wanting photographs in the famous reclining chairs, looking at Ugly Naked Guy and leaping out from behind Ross' curtains it got a little tricky at times to get nice clear photographs without people in the background. It was just about do-able if we were very quick but it did get a little hectic and I've heard from friends that some studio times are busier than others. One good part that we really appreciated was at the end of each apartment tour everyone was asked to come off set to clear the room so that people could get photographs of the apartments without anyone in the way. The staff are very good at controlling the situation and helping people get the photographs that they want - although do note that you're not guaranteed to be able to get every shot that you want without people in the background! 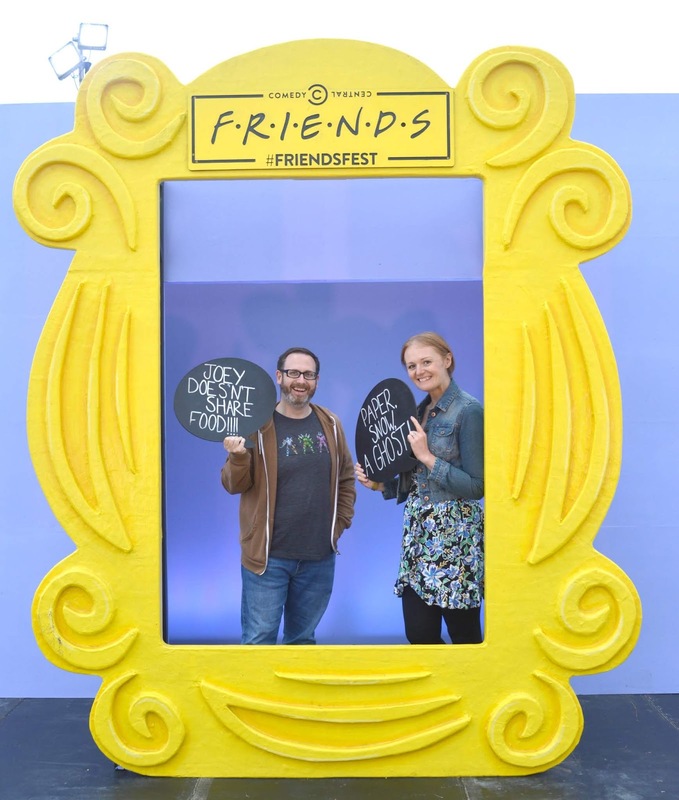 We really enjoyed our evening at Friends Fest but at £27.50 a ticket we did both feel that the ticket price was a little steep and could only be justified if you're a really huge Friends fan who doesn't mind the crowds. Friends Fest is at Castle Farm Fields in Newcastle until Sunday 29 July before moving on to Manchester, Bristol, Brighton and London. Tickets cost £27.50 per person Click here for full information on tour dates and to buy tickets. Great review Chloe. I really want to head along to this. I’m hoping I might get to come along at the weekend when we get back from Butlins. Love your cheeky title! Ooooh yes try and get yourself along - you'll love the photo opportunities! It's a shame it's not visiting a few more cities, we're very lucky it's come to Newcastle! The ticket price is a little steep, I think if you planned to go with a big group of friends you could make a day out of it and really get your moneys worth but I think Simon and I would struggle to spend more than about 90 minutes there! The photos are constantly popping up on my instagram!